Running Boards for Trucks and SUV's here at Running Board Central! 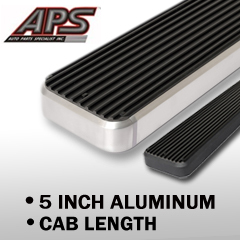 running boards, side steps or nerf bars you need to enhance your truck or suv. Why stuggle when entering and exiting your vehicle - specially if it's a little high off the ground. Installing a set of running boards, side steps or nerf bars makes perfect sense! After all, isn't safety number one priority? Running boards, otherwise known as step boards, offer a safe and secure way to enter or exit your vehicle by providing a large flat slip resistant and stable platform for your foot making sure you or a friend or loved one won't slip and injure yourself in any way. We carry running boards of many shapes and sizes with choices of finishes for most vehicles including Chevy running boards, Dodge running boards, GMC running boards, Ford running boards and many more. Copyright © 2019 American Truck n' Auto Accessories.